Philip Fisher - Pioneer of growth investing. Author of 'Common Stocks and Uncommon Profits'. 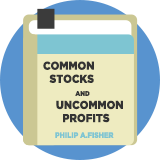 Here follow a selection of stock screening strategies that we have modelled based on the writings of or about Philip Fisher. These strategies are not endorsed by the author.